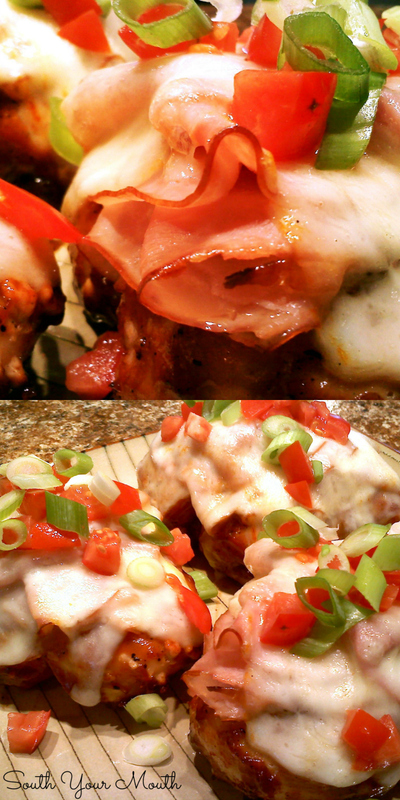 Grilled chicken with barbeque sauce, smoked ham and melted cheese. Way back when I was in college I met a gal who would become my roommate and one of the dearest friends I've ever had. Shelly and I met when I flung the door to Ebert Hall open and almost knocked her over. One of us said something off-sides and hilarious and then we pretty-much became inseparable. Shelly and I were as much alike as we were different. We were different in that I was a girly-girl who never went anywhere without my hair done, makeup on and fully accessorized and she was an athlete who played basketball and softball for our school and never went anywhere with hair done and makeup on. While she was busy running the basketball court, I was busy picking out dresses for the homecoming court. We were the same in that we were both from small Southern towns and had deep, deep roots in our country upbringings. We could both sing every single word to every single Hank Williams Jr. song. We both owned rod & reels and could bait our own hooks. And we could both drink a 12-pack of beer (apiece) in one night. It was always a real joy to go home with Shelly to Tiger Mountain in Clayton, GA. I didn't even know Georgia had mountains, yet when that first trip home wound us through dense forests of green foliage on winding roads and steep slopes we were, sure enough, deposited into Appalachia at the foot of the Smoky Mountains. Going home with Shelly meant home-cooked meals with her large family, swimming in creeks and rivers and window shopping in a small downtown that had not yet been extinguished by Wal-Mart. On the rare occasion that we actually had money that wasn't slated to be spent on beer or gas, we’d eat at one of the local favorites, such as The Dillard House in the neighboring town of Dillard, GA. I don’t know if they still serve it, but circa 1994 I had The Dillard House’s Smoky Mountain Chicken and fell in love. I had never had it since but I’d never forgotten it either so this weekend I set out to recreate it. I didn't find many recipes online for it but I did notice that some used bacon and others used ham. Since the one I had was made with ham, that’s how I made this one. Marinate chicken in Italian dressing for 4-6 hours. Season liberally with salt and pepper then grill* low and slow until just done (about 30 minutes). Baste chicken generously with barbeque sauce on both sides the last 5 minutes of cooking time. Top each piece of chicken with 5-6 slices of ham then one piece of cheese. Remove chicken to a baking sheet and bake at 350 degrees for 5-10 minutes or until cheese is melted (or if using a gas grill, turn off heat and cover until cheese is melted). Toss scallions and tomatoes with juice from the lime then sprinkle over chicken pieces when ready to serve. Serve with extra barbeque sauce on the side (or if you're feeling really snazzy, drizzle the chicken with barbeque sauce before adding the tomatoes and onions). This would be a great dish to feed a crowd as you can prep everything up to the oven stage and then bring to temperature when melting the cheese. Oh my goodness that looks good. I've got to try that, specially since my a/c is barely working and it's too hot to cook in the house. July+ Tx = too hot to breath let alone cook. I hear ya! Unless I'm having a chocolate emergency, my oven doesn't come on in July and August! I love that you said snazzy. That reminds me of my sister. The chicken sounds wonderful! Mandy ... girl, I love your style and recipes! When I flip through my family favorite recipes, your name is popping up more than some of my relatives. This chicken delight will be on our table Monday night this week ~ thanks for sharing the goodness.